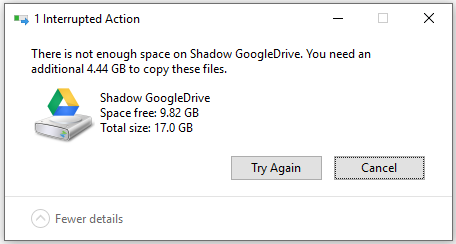 When Google Drive “Team Drive” is mounted as local drive, the mounted drive is showing my personal google drive’s available free space, although I have unlimited space on my team drive, I can’t upload any file that’s bigger than what’s left on my personal google drive because it thinks I don’t have enough space. Please use NetDrive 3.7. The issue is addressed in NetDrive 3.7 and you can download it here. It’s a beta version and it will be changed to official release soon.